FREE. Santa flies in for a visit and hands out candy canes. BYO Camera. Included with regular admission. Santa flies in for a visit with the kids. BYO Camera. Nov. 23, Dec. 8, Dec. 22. Included with regular admission. Santa hangs out at the train museum with a couple cute reindeer you can pet. (Check website for times.) BYO Camera. FREE. Check out an awesome St. Louis Gingerbread Village (complete with 5 foot chocolate Arch) while chatting with Santa and Mrs. Claus. Listen to carolers while sipping champagne (for the adults!) or hot cocoa and snacking on fresh cookies. BYO Camera. Put on your PJs and enjoy a breakfast buffet with Santa! Kids can do holiday themed activities while you watch the St. Louis skyline from the cozy cabin of the Becky Thatcher riverboat. $38, kids under 3 are free. FREE. Children can bring a letter for Santa, or write one on the spot. BYO Camera; Reindeers will be on hand Sunday. Included with regular admission. Santa visits with kids. BYO Camera. FREE. Visit with Santa and Mrs. Claus, crafts, cookies, hot cocoa, balloon animals, face painting and a tree lighting ceremony. Buy a photo or BYO Camera. Free (toy donation requested). 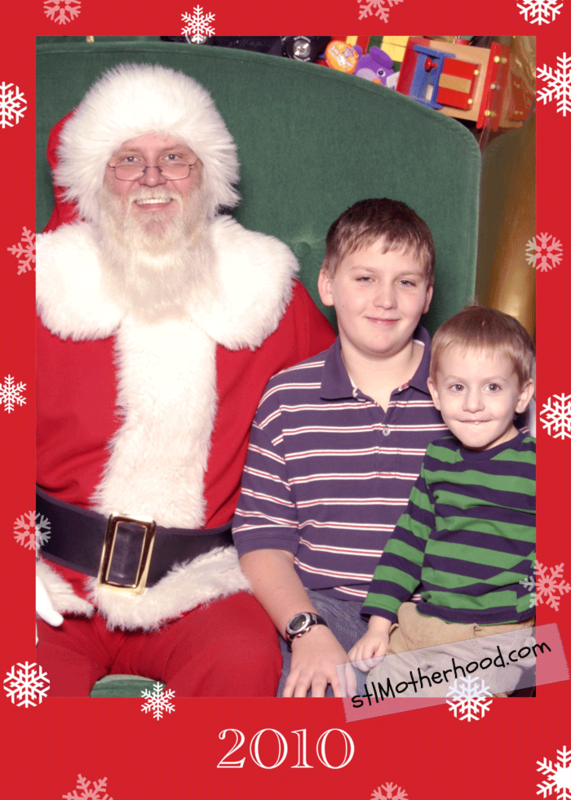 Visit with Santa and get a free photo. There will be balloon animals, face painting and a goodie bag for kids. Must be in line before noon. FREE. Meet with Santa, kids will get a holiday cookie. BYO Camera. FREE. Visit with Santa, make a craft and enjoy cookies & hot cocoa. Tree lighting at nightfall. BYO Camera. Dec 15, 5-10pm; Dec. 16 10am-3pm. $10 in advance, $15 at the door. New event! Held in Brookdale’s heated barn, includes holiday hayride, carriage ride, cow train for the kids, live music, crafts for kids and adults, food, cash bar and photo ops with Santa. FREE. 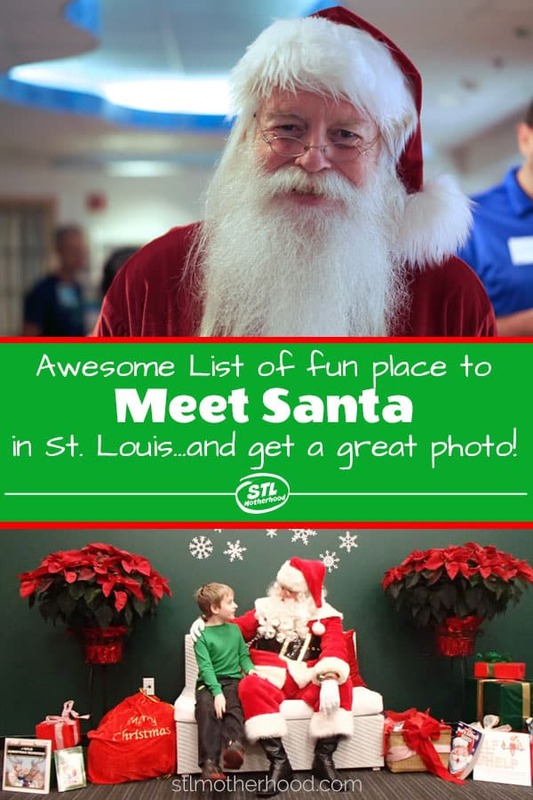 Get a free photo with Santa, play some games and do a free craft. Kids can write a letter to Santa and get an email back. Public Square • Downtown Belleville, Il. Photos start at $8, cash or check only. A tradition since 1963, operated by the Optimists Club of Belleville. Get a snap with Santa in his cottage while visiting Historic Main Street during the month long Christmas celebration. Packages start at $20. FREE. Santa swaps his reindeer for a Harley! Free photos. $4. Story time, puppet show and home baked cookies from Mrs. Claus. Great for little ones. Santa arrives in a firetruck! BYO Camera. FREE. Santa and one of his reindeer will visit with kids. Photos are $20. FREE. Visit with Santa at the decked out train station. Santa will bring real reindeer on the 14. BYO Camera. Packages start at $39.99, RSVP available online. Free video with premium package See Pet photos and theme days here. Packages start at $34.99, RSVP available online. Free video with premium package. Pet nights on Mondays, other theme nights here. Packages start at $29.99, FastPass available online. Free phone call from Santa with every purchase. Packages start at $29.99, FastPass available online. Free phone call from Santa with every purchase. Pet nights on Mondays.